This was a pretty cool episode. Veronica got the chance to be the hero again. Even better, this is merely the beginning of a three-parter! Betty put her “skills” to good use. The only real downside to this episode is Archie being his usual idiotic self. I’ve recently realized it’s too much work for me to do a full episode review every week. When I subtract work at my actual job and any chores around the house, my actual free time is fairly limited. It took me well over 7 hours to write this review (that includes watching the episode, writing the text, and taking screencaps), and it typically takes me a little shy of 4 hours to create the post (correcting the text and uploading and inserting the screencaps in the proper spots). A review of “The New Archies” takes a bit less time. A review of “Riverdale” takes way more time. I can’t do this every week without my other interests taking a back seat. I have plenty of DVDs to watch. I also write fan fiction and original fiction. Therefore, after Halloween, this blog will alternate between a TV review and a comic review. I can typically review a comic story in around an hour, and it takes me way less time to create the post. The TV reviews every other week will be whatever I happen to get done. The comic reviews will probably cover primarily the “Betty’s Diary” and “Cheryl Blossom” series. 1. 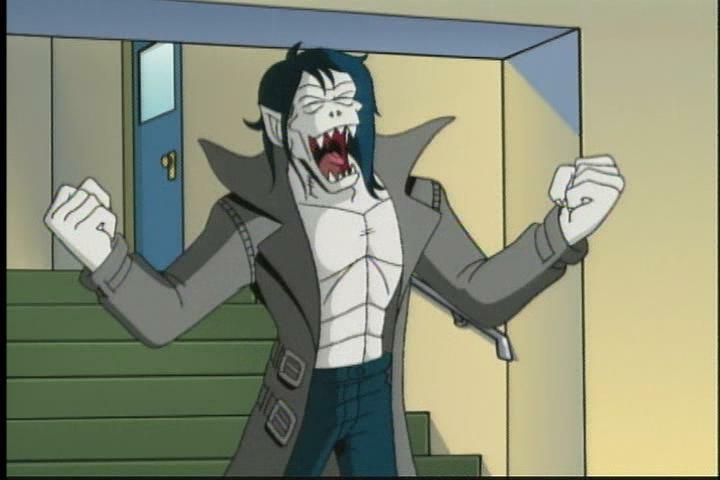 Thats actually a very cool vampire design, especially considering its Archie. They did a good job making them look distinct from fanged humans. 2. Again not an expert, but doesn’t Archie date both girls. He comes across as a real jerk here, going after yet another girl! Betty and Veronica should date Dilton..or each other. PS: obvious vampire is obvious. 3. Dr Strange is in Archie now? 4. These chosen one prophecies get really weird, I bet every citizen of Riverdale has been the chosen one for some prophecy at least once by now. Have you thought of breaking your recaps of an episode into two parts, I won’t mind. If you’re doing episodes of this series in no particular order, do you take suggestions? Archie definitely is a jerk – at least in the modern Classic Archieverse comics. In the old comics, Archie did date Betty at first but then started dating Veronica and was usually just oblivious to Betty’s feelings. New Riverdale replicates that. In the modern classic comics, though, Archie dates both girls, often accidentally making dates with both of them (plus even Cheryl sometimes) in the same location at the same time. Or maybe different locations at the same time. Or he’ll get Betty to fix his car – only to reveal he needed it to take Veronica out. Or he’ll fall for any random cute girl. And Betty, Veronica, and Cheryl degrade themselves by fighting each other for this dude. This show tones all of that down a bit, but it’s still there. I don’t wanna split the episodes into two-part reviews. I want each review to cover a complete story. I do that even for the comics (Bad Boy Trouble!, Civil Chore); if there’s a multi-issue story, it still gets covered in one review. I broke order only because I decided, at the last moment, to keep the horror theme started with “I Was a 12 Year Old Werewolf” going all October, leading up to Halloween. In other words, it was just perfect timing with that first review of the month, followed by a flash of inspiration. Other than this, I won’t be breaking order. Geez what do Betty, Veronica, and Cheryl(who from what I get is a meaner Veronica) see in the guy. Its funny that he actually became more of a jerk after the 50-70 era(if thats what you mean by “old comics”)? Ah ok. You could always do half an episode a day, and then only post it when the whole review is done. I gotcha, thats why I asked. BTW my username is a reference to an episode! 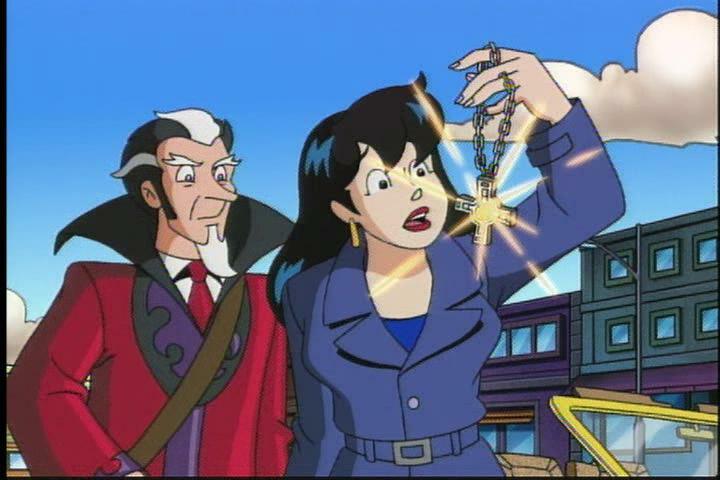 Yeah, Vinnie Wells “just wanted nachos”, which led to him stealing a time-travel device Dilton had invented, which led to a jail term, and then his future time-travelling self breaking him OUT of jail, so that both young and middle-aged Vinnie could team up to seek revenge on Archie Andrews and the town of Riverdale in general. That story was also a trilogy, and a better one than the vampire trilogy IMO. You should have reviewed that one, Mark. Yeah, I know, no Halloween connection. The last episode in the time-travel trilogy was the best of the entire series, with homages to the very first Archie story from PEP #22, a wilderness scout (in 1699) named Bob Montana who founds the town of Riverdale (with a little help from a time-travelling Archie), an ADULT time-travelling Archie Andrews (in addition to his teenage time-travelling self), and other neat easter eggs. BTW, Mr. J. W. Nachos, that’s Dr. Beaumont (not Dr. Strange) who runs a curio shop containing many weird artifacts in Riverdale. Both Beaumont and Scarlet returned in “The Return of Scarlet” (what else?) in ARCHIE’S WEIRD MYSTERIES #12, so there’s actually a *fourth* chapter to the vampire trilogy. Scarlet was also featured in a short backup story in AWM#15, “Scarlet’s Guide to Vampire Hunting”. I think both of those were reprinted in the AWM trade paperback collection from 2011, as well. I also seem to have a vague recollection that Vinnie Wells returned in a story in AWM, but I can’t be sure. Be careful not to reveal too much, I wanna see Mark’s reaction! **Swear to God, it’s in the episode. After Vinnie Wells steals the time-travel device from Dilton (after being ejected from Pop’s where he unsuccessfully attempted to mooch money off everyone to buy nachos), he mentions that he hopes to sell Dilton’s device for enough money to buy plenty of nachos. “Most Original Motivation For A Time-Travelling Villain”?